Natural sugar crystals deeply exfoliate dead epidermal cells, leaving your body exceptionally smooth. The skin becomes silky soft and regenerated. 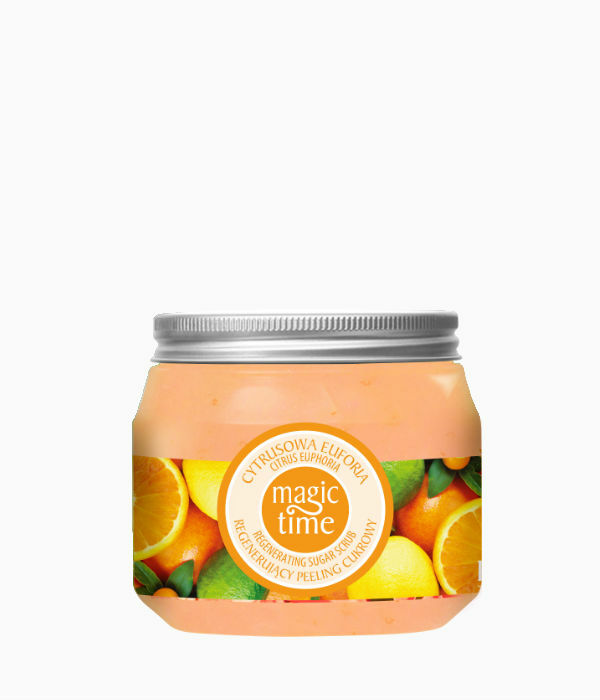 Energising, fruity scent refreshes and stimulates to action. Usage: apply a small quantity of scrub to wet skin, gently massage the body and rinse off. Use 1-2 times a week . Excellent for dry and normal skin. Paraffinum Liquidum (Mineral Oil), Sucrose, Sodium Chloride, PEG-40 Hydrogenated Castor Oil, Petrolatum, Caprylic/Capric Triglyceride, Silica, Butyrospermum Parkii (Shea) Butter, Paraffin, C10-C18 Triglyceride, Cera Alba, Stearic Acid, Citrus Aurantium Dulcis (Orange) Peel Oil, Glycerin, Pumice, Tocopheryl Acetate, Phenoxyethanol, Ethylhexylglycerin, BHA, Parfum (Fragrance), Limonene, Linalool, CI 19140, CI 16255.